So, the fourth iteration of the Marvel Zombies comes to its conclusion. Overall, Fred Van Lente and Kev Walker have conjured up a nice, compact tale of voodoo drenched dark horror, alleviated by the occasional appearances from the head of Zombie Deadpool, and his silent companion and means of transport, Simon Garth. They get to play their parts, with Deadpool getting the better of the deal (but hey, everyone loves Deadpool, so that’s okay, right?). The Midnight Sons, Man-Thing, The Hood – they all get their stories wrapped up. The plague cloud poses its threat. Hellcat makes a brief appearance. There are some Zombies in it, but this latest tale of the Marvel Zombies has been less concerned with the undead than a horror-mood. I think they managed to achieve it, making the title redolent of the many creature feature and horror titles that Marvel churned out in the 70’s. This tone, with the added mysticism that the Dread Dormammu added to the proceedings, gave the title a unique and generally successful air. Okay, maybe the conclusion is a little too neat and tidy, a little too pat – but taken as a whole, I enjoyed this tale of the Midnight Sons, and the fact that Van Lente and Walker raided the C and D lists of Marvel characters (again, like they did in MZ 3) and made something compelling and worth reading. Was the last issue entertaining? Not as much as the first couple of issues. Will I be reading the next chapter in the Marvel Zombies saga? Hell yes – and it looks like we are going to be getting some Suydam covers as the franchise reinvents itself again – by going back to the characters from the first 2 Marvel Zombies series. After reviving the Marvel Zombies franchise with its third iteration, starring Jocasta and (the superb) Machine Man, and just months after its finale, dynamic duo Fred Van Lente and Kev Walker have brought the first issue of the fourth installment of Marvel Zombies. I am glad to say it continues their good run of form. Marvel Zombies 4 is a lot of fun. The idea of a supernatural super-team is nothing new, but in this context, having ‘The Midnight Sons’ chasing down the undead works perfectly as a concept, even though this first issue is really just re-establishing characters such as Morbius and Jack Russel (aka Werewolf by Night). There is plenty of humour streaked throughout these pages, whether it be Jennifer Kale poking fun at the Son Of Satan (aka Daemon Hellstrom) and his demonic laugh, or the fun to be had with a zombie Deadpool who is now nothing more than a head. Yes, a zombie Deadpool who is nothing more than a head. The beauty of this is, that teamed up with Zombie Simon Garth, Deadpool steals all the scenes he is, with some absurd situations working brilliantly thanks to the humour in Van Lentes writing and Kev Walkers great and gory art. There are even some undead in there, but not what you would expect at all. There is some darkness and a lot of blood and violence, with Morbius especially full of rage after his experiences in Marvel Zombies 3 (but this rage is what is propelling MZ4), but it is tempered by the lighter moments when Deadpool brings some excellent comic relief. A great start – I think this is going to be one of Marvels strongest titles during its short run. 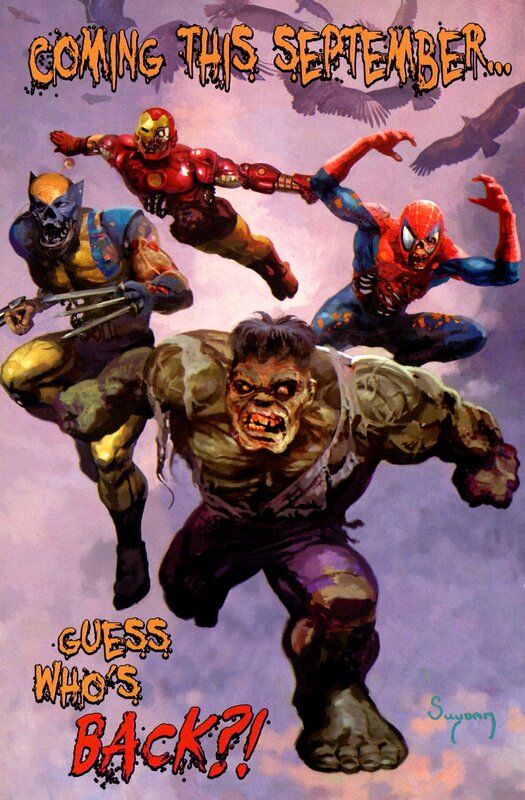 Who would bet against there being a Marvel Zombies 5? Marvel Zombies 4 #1, Written by Fred Van Lente / Art by Kev Walker, is out now.